So, Real Techniques brushes. I’m sure you’ve heard of them, but just in case you haven’t, Real Techniques is a brush brand that was launched by Samantha and Nicola Chapman in 2011. If you don’t know who they are, they are better known under the screen name “Pixiwoo” on YouTube, where they have created a plethora of beauty tip and tutorial videos for an ever-growing audience. They are certified makeup artists that have worked in the industry for over 10 years, and often site their aunt, who was a top makeup artist in London with clientele such as David Bowie and Princess Diana, as their inspiration to get into the business. Fun fact: Jim Chapman, of YouTube fame (but now he models and is quite the celeb in ol’ England), is the duo’s little brother. Anyways, getting back to the brushes, Real Techniques brushes are very well-known and well loved in the beauty community, as they basically took the world by storm instantly after their release. The curious cat and beauty addict in me, of course, needed to give one a try, and it only recently occurred to me that I’ve not mentioned them much on Beauty Bylaws! Thus, let’s give these a closer look, shall we? As you can see, I currently own 5 of these brushes. In terms of the design, these brushes hit it out of the park. I really like how they look, with their sleek, slim design and colour coded aluminum handles; eye brushes are purple, base brushes are orange and finishing brushes are a pretty pink. A unique and super handy feature of these brushes is that the majority of them stand…on their own…with no support. I’m lucky, all of the Real Techniques brushes currently in my collection do this, but if I ever decide to buy any of the smaller brushes, like the eye liner brush or the brow groomer, I may not be so lucky (which I’m fine with, the ones I care about more are the face brushes). Instead of numbering their brushes, like most companies do, Sam & Nic opted for individual names, which are scrawled across the ferrules (or, in this case, the handles) in a simple, legible script. The aluminum design really makes these brushes stand out, as they seem sturdier than most other brushes that I own, without being heavier to hold and I enjoy knowing they are durable and pretty much impossible to break when I carry them in a smaller makeup bag. Plus, I don’t have to be extra careful when I clean them; the narrow opening wouldn’t allow much water in, even if I tried, and if any water does get in, I don’t have to worry about the ferrule separating from the handle, because with these brushes, the ferrules are the handles, and vice versa. 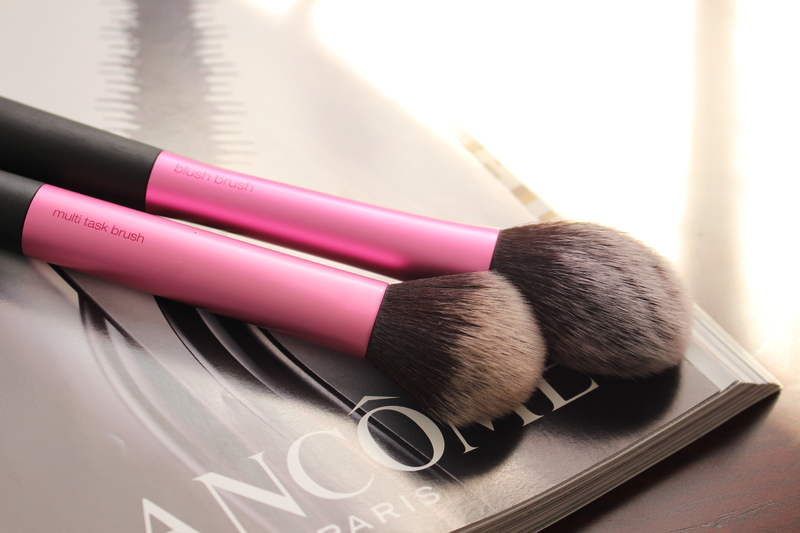 Furthermore, the synthetic bristles are ultra soft and make it easy to apply and blend anything from cream to powder. 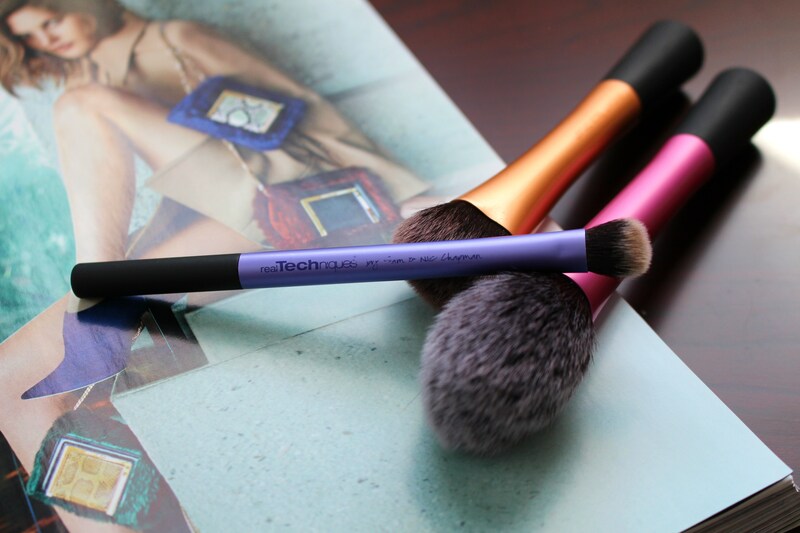 The only eye brush in the Real Techniques range that I own is the domed shadow brush, which came as a part of the Travel Essentials collection. Think of this one as the MAC 217 brush, but better, as it’s fluffier shape and lightweight design make it easier to use than the 217. Funny enough, I actually don’t use this on the eyes all that often (though it is especially nice to use in the crease to build up deeper colours), but it is one of my favourite concealer brushes. This brush provides flawless coverage that makes me look like I spent hours on my face or like I have my own personal makeup artist at the ready daily, when really, I just use this little guy. Despite what others may think or say, the base is always the most important part of any makeup look, because, let’s face it, it’s no fun to look at pretty eyelashes or gorgeous red lips when the backdrop consists of patchy foundation (*shudder*). This is where the RT base brushes come in! Ironically enough, this category contains one of my most used makeup brushes…and one of my least used. 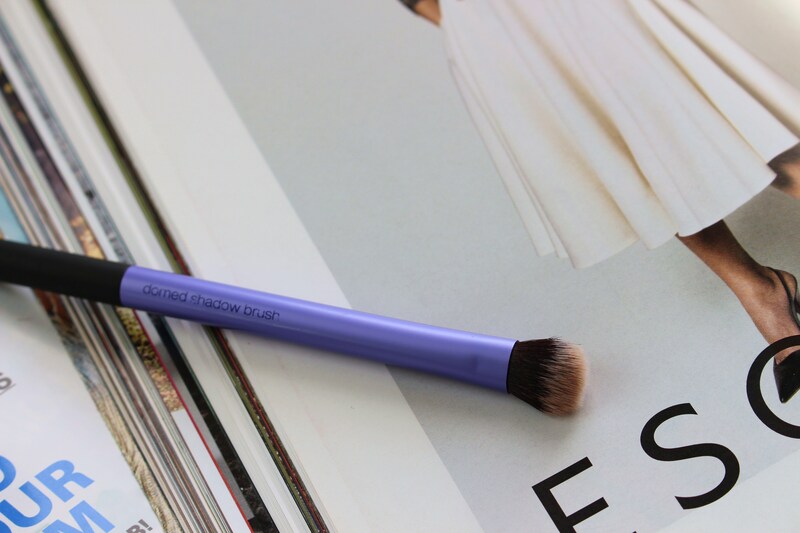 Let’s start with the latter, the essential foundation brush. I hardly ever wear foundation (seriously, I only own one bottle of foundation, and that was kind of a mistake in retrospect because I never use it! ), so obviously, I’m not going to have much use for a foundation brush. Every so often, I do bust this one out to use with my cream contour if I’m trying to create a super sculpted effect, but that’s not a look I go for often. On the other hand, the expert face brush has become a much needed part of my daily routine, as its unique small, domed shape is perfect for applying blush to the apples of the cheeks or a spot of bronzer in the hollows of my cheeks and across my forehead and jawline. Finally, we have my most used brushes of the bunch, the finishing brushes. I don’t even know what I would do if I *gasp* heaven forbid…lost or broke one of these brushes. The blush brush is one that I use fairly often, and I use it for…well, blush, but I have been known to use it to set my concealer with powder or even to apply a light dusting of highlighter from time to time. Alternatively, the multi task brush is a part of my daily routine and I love it so much that I have been known to “forget” to wash it because that would mean not using it for a whole 24 hours as it dries. This is THE perfect brush for face powder. Seriously, I need to get my hands on the mini brush trio, just so that I can have this brush in mini form (and if that’s the case, look out world, nothing’s going to stop me now!). This brush is a miracle worker, a magician of sorts, with its ability to take powders, even ones that would usually come out cakey and patchy, and turn them into light, barely-there (in a good way), perfect wonders. Just try and overapply with this bad boy, I dare you! 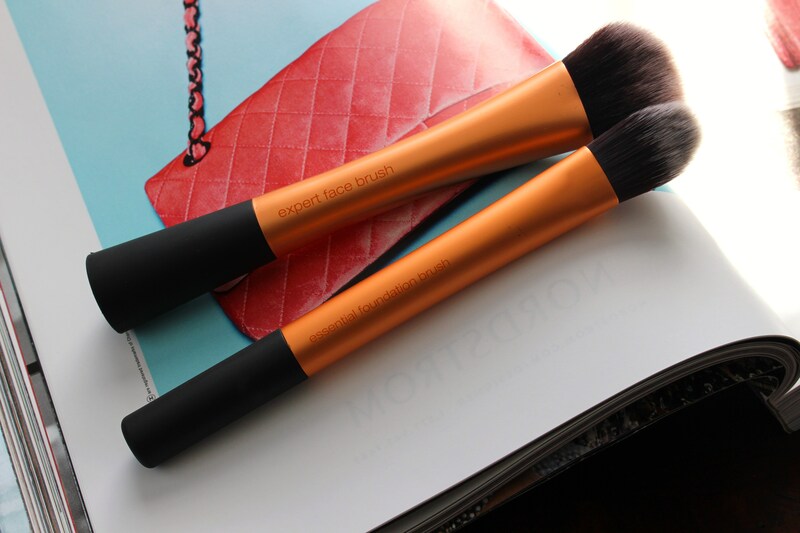 The best part is, this über soft brush with flexible bristles can be used for any powders that you would use, like blush, highlights, contours, bronzers, etc., but I think it works its magic best with blotting or general face powders. I will go to my grave with this brush clutched in my left hand and MAC’s Deeply Adored Lipstick in the other (and that, folks, is how you know I’m a true makeup addict ;P). So, it’s time for the verdict. 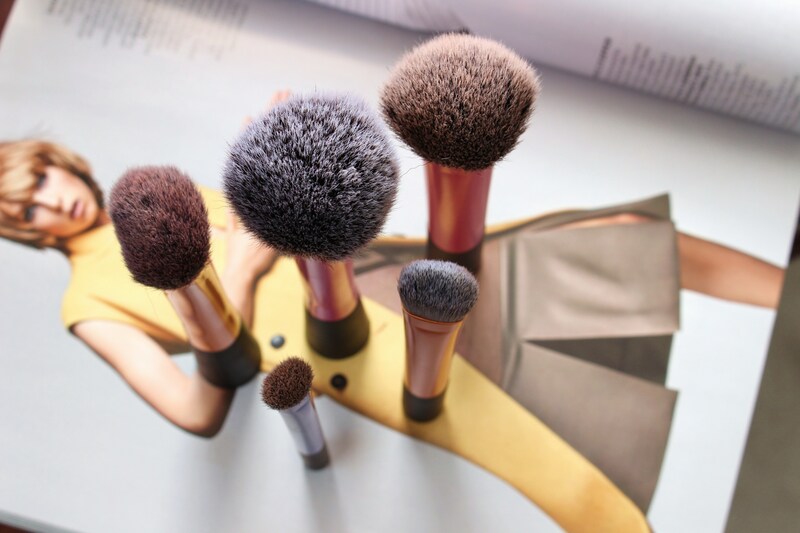 Are the Real Techniques brushes a beauty or a bust? I’m assuming you saw that one coming, haha, but yes, the much-hyped Real Techniques brushes are indeed, a beauty. I absolutely love the way that they can take virtually any product and translate it into utter flawlessness on my face. More importantly, these brushes are incredibly affordable if you consider what they offer, and are now widely available at multiple retailers across the country (namely Walmart here in Canada). I mean it, no single brush costs more than $15 CAD, which is amazing value for money. With good care, these brushes have lasted me over a year and a bit and I expect them to last me another 10 (fingers crossed). I would definitely say that these are worth the hype that they recieve and more. Yup, they are just that fantastic. So, where can you pick these up? In Canada, Walmart sells the kits for now and are expected to get the individual brushes (or so I hear, but who knows), but you can also get them at FTB Beauty’s website, which is one of my favourite online stores for products that are normally unattainable here in Canada. In the US, they are available at Target stores and Ulta stores, plus the Ulta website. And if you are lucky enough to be in the UK, these are available at Superdrug, Boots, FeelUnique.com, and other online stores. For a full list of retailers in your country, click here. Hope you have an wonderful day, friend!